As much as I love chocolate, I needed a bit of a break from it, seeing as a majority of the recipes on here have involved chocolate in one form or another. I flipped through the book, wanting to make something a bit more portable than a cake or a pie. I happened upon these little gems and knew immediately that I would be making them. I have always loved Mexican Wedding cookies, with their crumbly texture and subtle sweetness, but I had not yet made David Lebovitz's version. While the cookies were still warm, I tossed each one in powdered sugar, coating them completely. This sweet coating served two purposes: it added a pretty coating and made them even tastier than before. Do not wait for a wedding to make these. Cream butter, sugar, and vanilla until light and fluffy. Stir half the flour into creamed butter, then add water. Mix in remaining flour and chopped pecans. Chill dough for 1 hour. Preheat oven to 350. Line two baking sheets with parchment paper. Form dough into 1-inch balls and place on prepared baking sheet. Bake for 15 minutes, rotating halfway through. Cool. 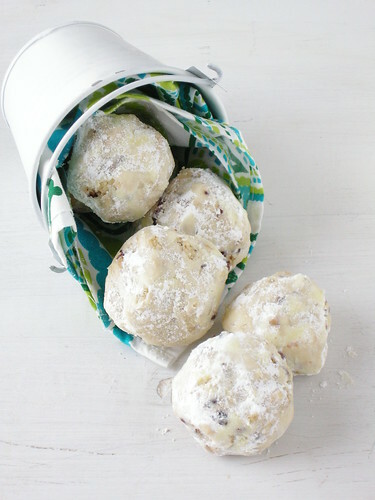 Toss cooled cookies in powdered sugar until completely coated in powdered sugar. I can vouch that they were great!! I love mexican wedding cookies!!! i wish i could have tried yours; they look amazing! for some reason it won't let me sign in, which is why I'm posting as anonymous..
great photo! my mom used to always make Mexican wedding cakes around the holidays, so I love them very much. great photo. these are my second favorite cookies (next to macarons.) You are doing a great job with your blog, keep it up. Yummy! Found your blog through Helen's. Have fun with your project! Found your blog through Tartlette. Loved the Julia, Julia project so I will enjoy watching yours from the beginning. Have fun baking and your photos are wonderful. I don't know how to sign on so I will have to be anonymous. Like a lot of others I found your blog through Tartlette. Good luck. I wish I had discovered blogging when I was younger (although when I was in HS I don't think there was much of a blogging community) because it's such a great community of people and a great outlet for writing and exploration. I imagine just by cooking your way through this book and joining the blogosphere you will learn a lot. What a fun senior project! Found you through Tartlette too. I love the photo of your wedding cookies. It's your best photo on the blog, IMO. The top view really shows off the food.